This one week exploration trip to Canberra – the capital of Australia and the surrounding regions reveals one thing – Australia is consistently beautiful, whichever the region. Just slightly different with each having its own ‘personalities and flavours’. Most of my friends’ impression of Canberra, being the seat of political headquarter, is ‘less exciting’ though they did not visit before. They could not be more wrong. Canberra is certainly charming in her own ways and a springboard to interesting attractions in the regions around her. Less touristy, less cars on the road, wallet-friendly parking with laid-back friendly locals but still offers an enticing Aussie experience. Compared with other regions on our previous road trips, we clocked a lot less time and mileage on the road while still pulling in the sights. This alone is one key reason why the Australia Capital Territory (ACT) should be your next travel destination. Read on as we highlight 33 activities that should tickle your senses. Tip #01 – A family saloon car or SUV vehicle is sufficient for this region routes. Tip #02 – The roads are generally safe as it’s paved and well-maintained. 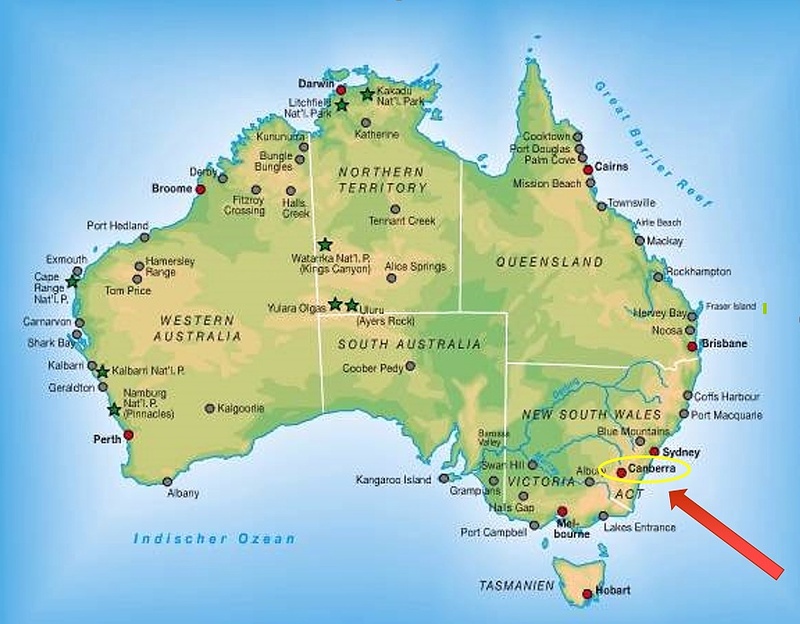 Australia drives on the left side of the road. Strictly observe speed limits in residential and school zones. Canberra has numerous self-governing junctions via its roundabouts. So do keep to the correct lanes when entering or exiting the roundabouts. Tip #03 – You will need an international driving license, if your driving license is not in English. But you must also bring your local driving license as it will be required for verification by the rental car company. Tip #4 – Contact Jetabout Holidays as you will be assured of reasonably priced deals in road trip packages as Australia is one of their area of specialty. They work only with reliable car rental firms with complete insurance coverage for peace of mind. Officially called the Commonwealth Coat of Arms, the Australian Coat of Arms is the formal symbol of the Commonwealth of Australia. A shield, depicting symbols of Australia’s 6 states, is held by the native Australian animals the kangaroo and the emu. Our guide told us that this two animals are used because they don’t walk backwards, implying that Australia is always forward looking. There is no better way to start a Canberra trip than a visit to the Parliament House. Contrary to being bored by political stiffness, we were pleasantly surprised and love the spectacular venue, which is the heart of Australian parliamentary democracy and one of the most open parliamentary buildings in the world. The Great Verandah is the public face of Parliament House. This impressive foyer is used to welcome visitors and is the backdrop for ceremonies on the Forecourt. The ground outside the entrance is constructed of red Christmas Bush granite, quarried near Oberon in New South Wales. The front facade walls are clad in Paradise White Carrara Italian marble with all tiles grains running in continuity. The Parliament House lobby continues the meaningful attention to materials used. Its called The Marble Foyer which features 48 marble columns that evoke the muted pinks and greens of the Australian landscape as well as the colours of the two Parliamentary Chambers, clad in green Cipollino marble from Italy and creamy pink Atlantide Rosa marble from Portugal. Our guide even brought us to see her favourite shrimp-like fossils that was on one of the tiles, which was estimated to be some 345 million years old. The House of Representatives or lower house, has 150 members and is the house in which government is formed. The colour scheme of the House reflects the green associated with British Parliament’s House of Commons and the eucalyptus green of the Australian landscape. Colours in the Chambers are deepest at ground level and become lighter as they extend upwards. The Senate or upper house, has 76 senators: 12 from each state and two each from the Northern Territory and the Australian Capital Territory. The Senate reflects the red of British Parliament’s House of Lords and the shades of ochre red in the Australian landscape. The President’s chair was crafted by Canadian artisans Almer Komendant and John Jones, as a gift from the Canadian Parliament. What coincidence that we visited on the 8 March, which was International Women’s Day. In the picture, you can see the hand drawn portrait of Julia Gillard, Australia 1st lady PM, who served as the 27th Prime Minister of Australia and Leader of the Australian Labor Party from 2010 to 2013. She was the first and to date only woman to hold the positions of Deputy Prime Minister, Prime Minister and leader of a major party in Australia. From the roof, you can see how Parliament House is successfully integrated into Walter Burley Griffin’s original design for Canberra. It is placed on the land axis from Mount Ainslie, which runs directly through the centre of Capital Hill. Looking north from the roof, you can see Australian War Memorial, Lake Burley Griffin and Museum of Australian Democracy at Old Parliament House. From where we were standing, the chambers are beneath us, as the Parliament House is built into a hill. This also alludes to the fact that “the Parliament is NOT above the people”. The Coinage Act 1909 commenced the first steps for an Australian coinage, which spearheaded the establishment of a mint owned by the Commonwealth and independence from the branches of the Royal Mint. The first task of the Mint was to produce new coins when decimal currency was introduced on 14 February 1966. Since then, it has produced more than fifteen billion coins in circulation with the current daily capacity to churn out two million coins. The production line is mostly automated. The orange robotic arm in the center is affectionately called Titan. During our visit, it can seen sorting and lifting the barrels with weight of up to 1000kg of coins blanks for pressing. On the left is Penny, the Automatic Guided Vehicle bringing the drums to Titan, while Robbie (2 o’clock right of Titan) packs all the coins. Do look out for Titan performing a bow or dance moves when he completed his tasks, interesting humanisation pf robotics indeed. Observing the minting production – the elevated angle and behind glass screen meant limited angles for better photography angles but it was still a nice experience. The Sydney Olympics 2000 medals were minted here but its not the gold that is of interest but rather the bronze. The country pull back all the 1 cents coins in circulation to produce the bronze medals, so it’s said the bronze medals were “touched by all Australians “. A big load of coins in the dome at display at the mint gallery-AUD24,999 of 1 dollar coins to be exact. It is estimated that Australia loses 255 million coins yearly – “down the back of the couch, taken overseas in the pockets of tourists and stuck to footpath” costing the country $110 million annually to replace these coins. That’s 1 reason why the mint is pressing coins daily. Stepping through the front entrance to the Memorial, our attention was instantly captured by the Commemorative Courtyard. A cauldron with perpetual flame burns at the pond. Other than the Parliament House, this is one place all visitors to Canberra must visit. Galleries that commemorate both World War One and Two with many war artefacts that bring you back in time, of the hardship and atrocities of war. The Second World War Galleries show how Australians fought in campaigns against Germany and Italy in Europe, the Mediterranean and North Africa and against Japan in south-east Asia. Certainly hitting close to home, as Singapore was also part of the war landscape. The Roll of Honour contains the names of over 102,000 members of the Australian armed forces who perished during or as a result of war service. The Hall of Memory, located above the Pool of Reflection, is the heart of the Australian War Memorial. It can only be reached by walking past the names of the more than 102,000 who have given their lives in the service for the country. The Tomb of the Unknown Australian Soldier is placed here, at the still point of all remembrance. In the Hall of Memory, the Tomb of the Unknown Soldier lies directly below the dome, where the souls of the dead are shown ascending to heaven. The tomb is covered with a slab of red marble inscribed with gilded lettering, subtly mirroring those of the dome. Red poppies were among the first plants to spring up in the devastated battlefields of northern France and Belgium. In soldiers’ folklore, the vivid red of the poppy came from the blood of their comrades soaking the ground. Our guide told us the view from the Hall of Remembrance, looking out to the Commemorative Courtyard is one the best angles to shoot at the memorial. A pensive moment among the men before commencement of the daily Last Post Ceremony. 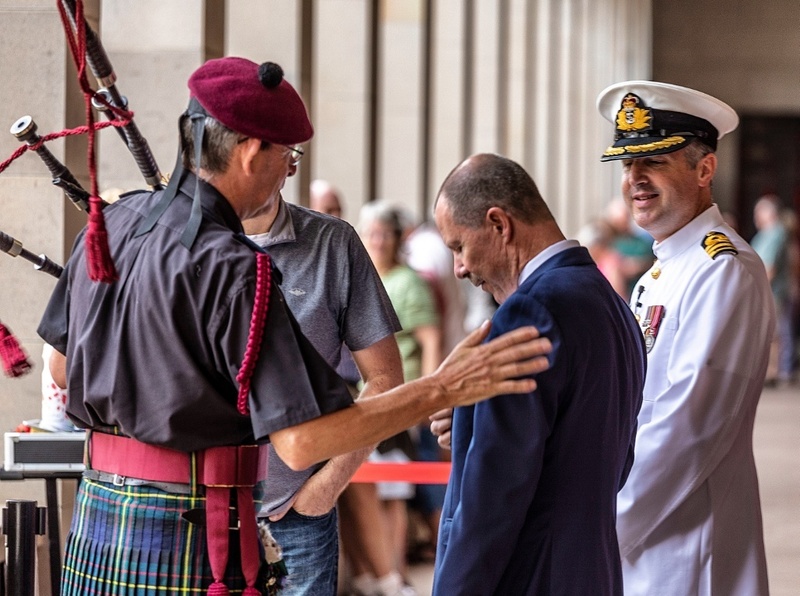 Commencing daily at approximately 4.55 pm (AEST-Australian Eastern Standard Time), the Memorial moves visitors with its Last Post Ceremony in the Commemorative Courtyard. Each ceremony shares the story behind one of the names on the Roll of Honour. Live streaming of the event can be viewed on YouTube or Facebook. Laying of floral wreaths for the fallen. Members of the public can request to the front desk daily by 4pm should they want to lay the wreath. The Last Post Ceremony is becoming an increasingly popular public event. It is recommended to arrive early, especially for large groups as the Memorial is unable to reserve spaces for groups. The evening saw us visiting the Canberra Enlighten Festival, where Illuminations have been extended to 11 nights this year to provide eye-catching backdrop for Canberra Day celebrations. Canberra’s Parliamentary Triangle and venues around town are transformed into vibrant arts precincts, showcasing Australian talent, roving artists, live bands and enchanting performances. My fave illumination is the Red Air, a series of larger-than-life lanterns that feature the designs of indigenous artists from the Pilbara, WA. Inspired by Guula, a colourful Koala adorned with symbols found in traditional Aboriginal possum skin rugs, can be seen among the projections on the buildings. A techno-music stage setting the mood for festival goers to get in the party mood. Singapore Airlines is one of the sponsors of the event, so don’t surprised when see SIA advertisements being flashed on the screen. An illumination installation among the malls in town shopping-dining belt at Bunda Street in Canberra Civic district, adding colours and points of interest. Day 2 saw us visiting the renowned award-winning Pialligo Estate. Just a 10 minute drive from our hotel at Capitol Hill, it is a working farm with 12,000 plants that includes an olive grove, vineyard, orchard, market garden and the award-winning Pialligo Smokehouse which is famed for its smoked seafood and meats including being named Australia’s Best Artisan Bacon producer. The vineyard host showing their latest crop of Shiraz grapes. Australia weather encountered hot and dry spell a few months prior to our visit and affected the crops at the farm, which had to draw more water from the Molonglo River just beside it. But on the day of our visit, it rained. Guessed we brought along good weather from Singapore. The estate is renowned for its fabulous food, wine and as a lifestyle destination. We especially love the paddock to table cuisine, which means only the freshest ingredients are used. My appetizer of smoked meat from the charcuterie was exceptional, with the crisp toast and pickles balancing the meat well. My travel mate’s platter of blue-veined cheese with assorted toasts and fruits as part of food-pairing. We skipped the wine-pairing as we were driving. Certainly a delightful way to end a perfect lunch. From the vineyard, our next destination took us to the famous Jamala Wildlife Lodge, just a 15min drive away. It is an award winning premium safari-themed lodge built within the world-class National Zoo and Aquarium. In the picture above, you can see the resident Cheetah, an adopted wild cheetah since birth, very tame and close to its caretaker. One of the highlights of our stay at Jamala was the feeding time at the Giraffe Treehouse, right outside our room balcony. It can be quite scary while exciting, when the huge face comes in close. The giraffe named Hummer was friendly and certainly make the stay even more memorable. Carrots are like chocolates to giraffes, so we were limited to two sticks per person during the feed. The giraffe tongue are dark blue to minimize sunburn and very slimy to prevent stinging bites of ants in the trees which they feed on in their native environment. Melati- the zoo’s Sumatran Tiger, looking at me intently behind her enclosure which gave me the perfect opportunity to shoot my best tiger portrait so far. The National Zoo and Aquarium is home to six tigers – Ravi, Baru, Ndari, Aceh, Mya and Melati. We also had the unforgettable experience to come up close and massage the white rhino, Eco. We learnt that a rhino can consume 60-80kg of food daily and up to 80 litres of water.The zoo is home to 2 male Rhinos- Ubuntu and Eco and is part of a regional breeding program. We also had the chance, among many other animals, to photograph the stunning cotton-headed Tamarin, which is one of South America’s most endangered primates. The zoo is home to 7 Cotton-top Tamarins, which are part of a national breeding program. The feeding session and commentary by the passionate zoo’s ranger enhanced the overall experience. In the pic above, you can see a Fallow Deer, originally only from Turkey and surrounding regions. They have since made their way around the world and now live in 49 different countries. Our dinner venue at the lodge comes with assigned sitting. The safari theme continues here with great food and ambience, almost like dining in a cave. I did not shoot the guests as we have to respect their rights to privacy. At the basic room rate of AUD1500 onwards per night, premium experience and high quality fittings are a given at this lodge. At night, you may hear the roar of the lions occasionally if you are a light sleeper. The skies over Canberra has low light pollution which makes star trails photography easier. The Milky Way, though less obvious during this season, can be seen above our rooms with the Southern Cross just to the right of the picture. We woke up on day 3 morning to a lovely chilly 10°C and spotteda hot-air balloon drifted by our room balcony and mist-fog right at the valley below the resort. What a great start to the day. After half-day of roaming the zoo, we check out of the resort and proceeded to the Beltana Road to check out their fruits orchard to buy some fruits for our road trip ahead. 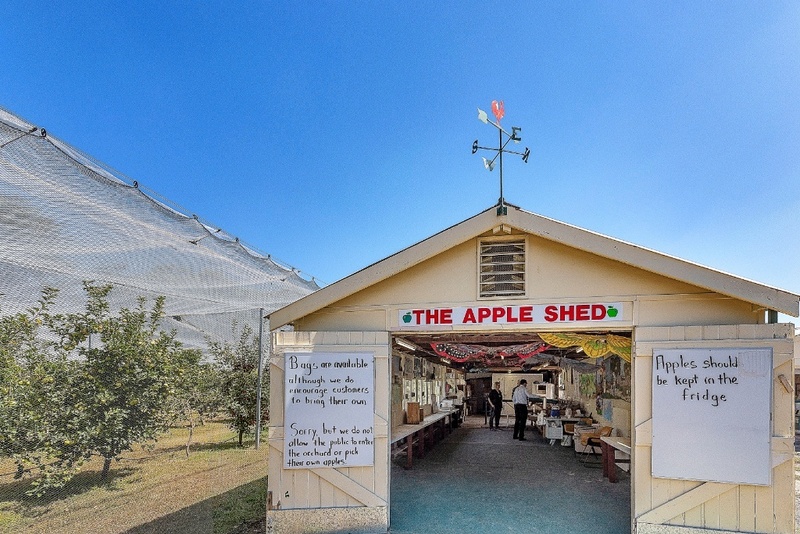 Certainly an interesting way to buy apples which are newly harvested. It can’t get any fresher than this. Always nice to see riped apples growing on the trees. This are the Classic Pippens apples – a versatile apple, great for eating fresh, cooking, for juicing and making into hard cider. The ever popular Granny Smiths apples, which promote the growth of good bacteria in the colon because of their high content of non-digestible compounds like dietary fiber and polyphenols, and a low amount of carbohydrates. After the fruits orchard visit, lunch was a convenient few seconds drive away along the road at this quaint sandwich cafe which serves delicious meals at reasonable price. About AUD20 for all this lunch with a bottle of lemonade, you will find prices are more wallet-friendly at Canberra compared to other states. The pulled pork and the BBQ sauce on the french fries were memorable but could not finish the fries as there was too much. Enroute to our next destination at the famous Pebbly Beach at Batemans Bay, we stopped for a coffee break at this little joint called The Deadwood Cafe. The proprietor had previously worked at The Albion Cafe, just 1 min walk away, which was our original intended stop. We had arrived at 230pm which the Albion Cafe had closed by 2pm, sparing us a 30min rest as this cafe closes by 3pm. The cafe is a former art studio, furniture workshop and news print office in the 1860s on Duncan Street. The new owner adapted and transformed the old building into a modern business. One of the most photographed buildings in the location, with the idea of “bringing the outside in”. Blooming with characters but don’t break anything within the cafe as “once broken, considered sold” as stated on the shop signage. The coffee here is really nice, just like all the coffee we had so far on the trip. We arrived at the Pebbly Beach, which is famous for its friendly kangaroos, after about an easy 1 hour drive from The Deadwood Cafe. The excitement started before we even see the beach, when we were greeted by flocks of Lorikeet Roselles picking up pebbles to aid in their digestion at the carpark. At the beach, you will find a sizeable resident kangaroo population quite happy to meet and pose for an Instagram-worthy pic. But of course, we did not harass or stalk the kangaroos. Pebbly Beach is located in Murramarang National Park and is a popular camping area with a great surfing beach and bush walks within the park. A mob of roos here but too bad I couldn’t gather them closer for a group shot. It seems they are pretty active and in larger number at late afternoon compared to the morning, as we will discover when we returned for another photo session the following day. I was so fortunate that this cute kangaroo stopped and gave me a quick glance, just enough time for one shot. Time past fast when you are having fun, so we had to return for another photography session as we planned to have a sunrise backdrop for picture. Our last stop for the day was a quick photo shoot at the jetty at Batemans Bay. A nice serene place and just steps away, is our dinner venue at the New Golden Dragon Chinese Restaurant, an authentic Cantonese diner with beautiful views of the river. On day 4 early morning, we woke up early to drive the 30min from our accommodation at Lincoln Down Resort to be in time the 713am sunrise. The mood was lovely at dusk, quiet, fresh and chilly at 12’C while the skies cast a golden glow. That’s why they called it the “Golden Hour”. Before the resident Kangaroos arrived at the scene, we were treated to fun time with this colony of Australian Wood Ducks. Moments like this are truly memorable as it’s rare as wildlife are usually cautious and keep a distance from humans. The 1st two kangaroos to appear at the area as we could not see others elsewhere, down the entire stretch of beach. Finally, I got the framing that I had in my mind, a sunstar on the back of the kangaroo. A reward for getting out of our warm toasty bed in the early morning. After the sunrise photo session at Pebbly Beach, we drove 30min to this intimate and cosy Oyster Shed at Batemans Bay, one of the nicest oyster sheds we visited so far. The al fresco dining area, relaxing vibe with a nice view of the Clyde River. It helped that we were the first to arrive that morning. Travel mate’s breakfast for the day. She got to enjoy the full dozen for herself as I don’t eat raw seafood or shellfish. Took the opportunity at the scenic location to shoot a long-exposure with myself standing at the end of the jetty. Scene like this are rare, if any, in our highly urbanised city. From the Oyster Shed at Batemans Bay, we drove about 30min to the Mossy Point cafe for a proper breakkie as oysters are just a starter for the day. The cafe is pretty awesome with great food and healthy crowd. Housed in an old general store established in 1939, the cafe mixes shabby charm with a modern Australian menu of café offering. It’s best known for smashed avocado, hummus, cherry tomatoes, red onion, salsa verde, pickled fennel, toasted pepitas, basil and dukkah spice, on toasted sourdough. But our order of bacon and free-range egg with mushroom came out perfect with the barista-grade latte. The cafe menu can be referred here. The lorikeet rosellas were closed by, waiting to pounce on our food. To most people, these birds can be pesky but what a beautiful pest. A short drive from the cafe got us to this lookout at Mossy Point Lookout, peeking out to the stunning Tasman Sea. On a southeasterly direction, if you fly an airplane, it would reach New Zealand in 6 hrs. Just another 30min drive brought us to the Bodalla Dairy Shed (established in 2008)- a micro-dairy in the heart of town, where they bottle milk exactly the way they want – “with locals, by hand, in small batches at very low temperatures to keep the milk alive and brimming with fresh grassy goodness, for families who care about living milk.” as stated by the dairy web page. Most visitors will succumb to their irresistible ice cream which they make from scratch with just a handful of ingredients. “Nothing is rushed here, they take great care to infuse their milk overnight with each ingredient so the flavours are just what you would expect them to be”. An ice cream made with love indeed. The dairy also has a very nice caffeine junction, as always. Actually, we have yet to drink any bad coffee in Australia as it’s consistently high quality. From the dairy shed, we drove just a quick 20min to the lovely seaside town of Narooma, where we check into the cosy Whale Motor Inn. The 2nd level room overlooks the scenic bay as the inn has a commanding view from its prime elevated location. The room is cosy and comfortable, although the inn was showing sign of age, being built in 1972. The Whale Motor Inn has seventeen spacious rooms and suites offering comfort, abundant light, fresh air and most have spectacular water and coastal views. From the inn, we could explore the heritage town of Tilba, after just a short 20min drive. Central Tilba and Tilba Tilba are two villages near the Princes Highway in Eurobodalla Shire (NSW). At the 2016 census, Central Tilba and surrounding areas had a population of 288 (Tilba Tilba had 95). We were lucky to spot this retro Volkswagen van parked besides an antiquated Caltex petrol kiosk, each complementing one another for a mood picture. The village is relatively quiet on weekdays, ideal for quiet chill outs. As in all venue, there is usually an anchor food attraction. The picture shows the town famous diner simply called Tilba Bakery. Certainly a delicious introduction of the quaint little village. Wholesome and delicious beef pie, with the seasoning done just right and meat not gamy, you can also choose chicken or lamb option, washed down with Aussie Bundaberg lemonade. Central Tilba and Tilba Tilba are two tiny timber towns in the hinterland behind the New South Wales far South Coast. They are located in the shadow of the once-active volcano which the local Yuin people called Gulaga and Captain James Cook named Mount Dromedary. The entire town, which has been classified by the National Trust, is the key attraction, which is actually a single street. Most of the houses were built in the 1890s when there was a minor gold rush in the area and when the gold fever waned, the town remained stuck in a charming ‘freeze frame’. For the past thirty years Central Tilba, the larger of the two towns, has slowly evolved from a small dairy town with a cheese factory into a trendy destination with boutique accommodation and a wide variety of gift shops and cafes. The main street has been well maintained with the timber exteriors being restored and the interiors turned into gift shops, cafes and coffee lounges. This quaint village is definitely worth a couple of hours to enjoy the ambience of a bygone era. From the heritage village of Central Tilba, we drove 20min to Bar Rock Lookout for another activity, observing wild Sea Lions which have been using the southern Narooma bar crossing breakwater as a haul-out spot. In fact, the famed Australia Rock also just steps away in the same vicinity and these marine residents are 2 key magnets of the town. Sea lions do not have a stable social organization during the non-breeding season. Dominance behaviors are most aggressive during the breeding season. Males establish dominance by open-mouth threats and vocalizations, pushing and shoving. Looking at those sharp canines will convince anyone to keep a safe distance. A sea lion wriggling off seawater from its fur after exiting a swim, just like what a dog does when their fur gets wet. The seal lions colonies have become a key attraction for tourists. But do not attempt to go near the sea lion as they can get aggressive and cause injury. Day 5 morning saw us waking up early again to catch the sunrise as a backdrop for the amazing Australia Rock located at the Bar Rock, located with just a 4 min drive from our accommodation. When viewed at the right angle, the hole in the rock bears an uncanny resemblance to the Australia continent (without Tasmania). There are several explanations for how the hole formed including that it is simply a natural result of thousands of years of erosion of the ancient chert and shale headland. To give a bird’s eye view of the venue, I did an aerial view with a drone. The Australia Rock is north of the two cars seen in the picture while the sea lions can be spotted on the rock boulders at the stretch east of the cars. Two interesting attraction at just one place. The day was young when we checked out early from the inn to commence on the day activities, by visiting the Mystery Bay, which was just about 20min drive away. One of Mystery Bay features is a camping area in the Eurobodalla National Park but our interest in Mystery Bay was it spectacular beaches that front the Tasman Sea. Some beaches are surfing beaches while others are ideal for swimming and many of these beaches contain impressive large rocks, which become rock pools at low tide. Along the Prince Highway A1, along our drive, we spotted many lovely scenes with lone tree, which is many photographers’ favourite subject. But the opportunity was limited by the availability of safe parking area as well as lighting condition and background details. Which was why we were doubly delighted when this photogenic tree with sheep grazing below it presented itself. As we proceed to our next destination, we made a short detour to Central Tilba for a quick breakkie and coffee break at the Tilba Teapot before proceeding to our next destination at Camel Rock, which is just 15min away. The pie and coffee are just as superb at this cafe too. This interesting rock formation, which is the among rocks in NSW at about 450 million years old, was identified and named by Bass and Flinders during the first mapping of the coastline of the colony of New South Wales. It is a popular attraction by both locals and visitors alike. Can you also spot the aboriginal woman outline at the left side of the rock formation? Landscape photographers will certainly love the seascape at this venue but as the golden hour is already over, we made do with we have and what we are given, with some help from neutral density filters to create a more dreamlike mood. A local angler at the area provided a human relief to the otherwise rocky and harsh seascape. With the strong wind and waves, I wonder what kind of fish he can hope to catch. A drone aerial view of the rocky outcrop and strong waves, shot at 100m height to better capture the beauty and expense of the bay. A group of surfers taking a break at the secluded beach. During summer months, the beach is patrolled making it the ideal family day out. From Camel Rock, we drove just 10min to the scenic Bermagui Fisherman’s Wharf which have fabulous dining outlets, art and recreational activities center. It was as opened in 2009 and follows 150 years of shipping that sprang from the pioneering industries – wattle bark (tanning), tallow, timber and dairy farming. The building was designed by international architect Philip Cox who based his creation harking back to those pioneering days. 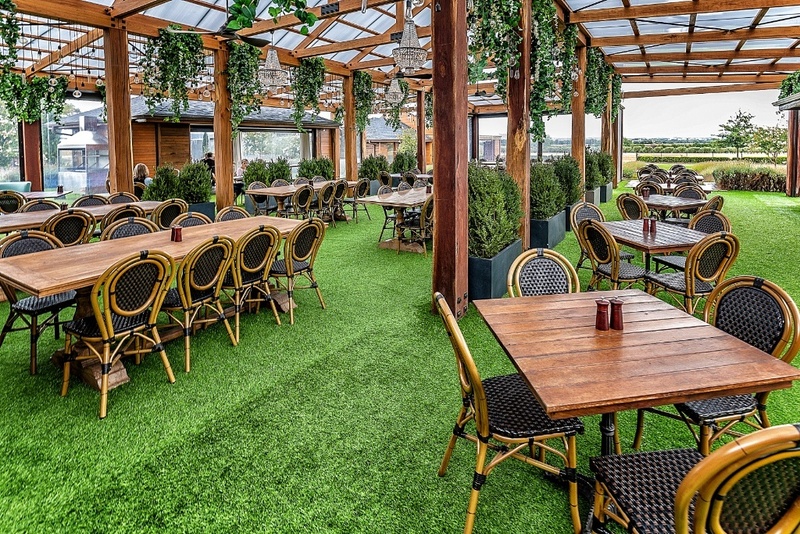 The venue ground features beautiful spotted gum trees that surround the township while being a hub to modern cuisine, art and retail businesses. This is also the place to see the day’s commercial catch pass on its way to the Bermagui Fishermen’s Cooperative, which was built into the heart of the building. The harbour itself was built in 1959 and is very popular with game fishermen who seek the big fish – the marlin and tuna. The noon sun was scorching but the low humidity and slightly cool sea breeze makes it comfortable to dine al fresco. Enjoy the sight of the fishing vessels and their gears while you stroll around the jetty. At the nearby Bermagui sand bank, you may spot flock of sea birds at the sand bar when driving the along the road which can make for interesting photo angles. There are also locals who may be foraging for cockles at the sand bar during low tide. As you can by now, plenty of nice to do and see are all complimentary. From the Fisherman Wharf, it took just a 5 min drive to reach Bermagui’s famous Blue Pool, which is a ‘must see’ Sapphire Coast attraction. It is located off Pacific Drive at the base of a dramatic rocky cliff face. It’s a washed with clean clear ocean water and is a wonderful swimming and snorkeling spot. But we weren’t prepared for swimming. Photographing the place was nice already. The steps down to the Blue Pool as well as the toilet, shower and change room amenities were reconstructed in 2010. A new viewing platform was also constructed which offers magnificent coastal views and is the ideal spot for shore-based whale watching during the migration season. The sea just beside the swimming pool, where strong waves constantly pound the rocky edges, renders it not suitable for swimming. A huge sized pool for all to enjoy, with a small pool beside it for children. Originally called the Blue Hole and only half its present size, locals enlarged and improved it to its present size in the 1940’s, blasting rock and removing it by wheelbarrow to be dumped in the sea. From the Blue Pool, we drove about an hour to our accommodation The Coast Resort at Merimbula, for a cosy and comfy stay for the night before we push on nearer to Canberra the next day. Full amenities for a comfortable stay, it’s like a home away from home. The cooking amenities, perfect for groceries we bought along the way at Woolsworth for a “home cook food” and early rest. At the tail end of a week trip, the availability of a washer and dryer were a godsend. This is the time we can minimise laundry chore back home by washing it in the apartment. We started day 6 early by checking out from the apartment as we have a long drive to towards Cooma for the highlight of the day – Thermal Gliding. But we can’t resist to spend some time admiring the oyster farms at Boggy Creek, which was just a few minutes drive from our apartment. Enroute to Canberra Gliding Club, we chanced upon this beautiful quaint little cafe affectionately called Purple People Feeder (PPF) which we reached after a 45min drive from the oyster farm. We only drank their latte which as usual, was exceptional. Given more time, a cosy breakfast here with a scenic view of the mountains of the Wadbilliga National Park will surely charm anyone. After about 1 hr drive from the PPF cafe, we finally reached Canberra Gliding Club after a drive along amazingly beautiful Snowy Mountain Highway (B72) route, where we were treated to the surreal beauty of sea mist which we even drove into. This segment of the road trip was the longest but also the most enjoyable part. When we arrived, the members of the club were getting the glider ready for my airborne adventure. Our tow plane for the glider – The Piper PA-25 Pawnee was one of the first single seat light aircraft to be specifically designed and built for agricultural spraying and dusting. Many Pawnees have nowadays found their way to a glider airfield where they are very popular as glider tugs due to their good power/weight ratio. Stewart, the glider pilot, giving me a safety briefing, dashboard orientation, do’s and don’ts. Stewart is an experienced glider pilot of 35 years with a great sense of humour. I asked when he started gliding, he answered “about 2 weeks ago”. Being a moderately-priced, versatile, modern two-seater with good handling qualities on the ground and in the air, the Puchacz (the glider in the picture) has become a very popular two-seater sailplane in many countries both for novice and aerobatic instruction. Fellow crew lending a steady hand as the glider was towed by the Piper. The ride on the field was slightly bumpy at this moment. Moment before lift-off. You can see the glider gaining lift as it is balancing only on one wheel. Into the blue yonder, the start of gliding as we climb to 4000ft before the release, looking for thermals. A thermal column (or thermal) is a column of rising air in the lower altitudes of Earth’s atmosphere, a form of atmospheric updraft. I was handed the control of the glider for a brief moment with the pilot giving instant feedback, as we catches the thermal to gain altitude awesome feeling. You have to be sensitive to the controls response as this glider can do aerobatics after all. Those with motion-sickness, be warned, a sick-bag is available at the side just in case. After about 30min flight time, it’s time to return to earth, what a ride indeed. Just had to do this farewell shot with our rental car before heading to our next destination, you don’t get many chances to do this. From Canberra Gliding Club, we drove an easy 1.15hrs to the Tidbinbilla Nature Reserve.-home to a wide range of Australian animals living in diverse sub-alpine habitats including wetlands, grasslands, wet and dry forests and woodlands. The name Tidbinbilla is derived from the Ngunnawal word ‘Jedbinbilla’ – a place where boys were made men. A koala snoozing in its arboreal perch, so true with the character of koala as we know. Koalas typically inhabit open eucalyptus woodlands and the leaves of these trees make up most of their diet. Because this eucalypti diet has limited nutritional and caloric content, koalas are largely sedentary and sleep up to 20 hours a day. One of the tell-tale sign of a koala is up a tree you are looking at, is to spot the defecation at the base of the tree. Looks like a coffee bean doesn’t it ? Koalas are asocial animals and spend just 15 minutes a day on social behaviours. This guy was forcing another koala off a spot he wants, rather anti-social behaviour indeed. A wallaby in its natural environment, perfect opportunity for a natural unstaged picture. A Skink Lizard among the vegetation. Small and well camouflaged, you might missed seeing them unless they moved about. A red-bellied Black Snake swimming in the pond. A venomous snake but it’s more afraid of human being than we are of them. An Australian water dragon, it is extremely shy in the wild but readily adapt to continual human presence in suburban parks and gardens. They are fast runners and strong climbers. When faced with a potential predator, they seek harbourage in thick vegetation or will eject from an overhanging branch into water. A fabulous apartment to end the week long exploration trip. The Burbury Hotel is part of the Doma chain of hotels. The officially rated 4.5 star property offers contemporary guest rooms, suites and apartments, along with a variety precinct amenities including fine or casual dining, wholefood café, lounge bar, hair salon, health club, day spa, lap pool and hydrotherapy spa. Probably the best sleep quality among all the accommodation on this trip. The Jamala Wildlife Lodge was exceptional too but this is up there with the best. Having such well-thought out amenities and high-end furnishings make the trip memories just that much more satisfying. This another exciting highlight of the trip that requires us to get out of bed early. As we have not attended a hot air balloon festival before, we had to reach the launch site early to check out the area for the ideal spot to shoot the action. The lift-off time was scheduled at 615am with the event wrapping up by 10am. This is be one event that will linger on in our mind for some time to come. This Canberra Balloon Spectacular is part of the Enlighten festival. The best view can be appreciated on the lawns of the Old Parliament House. Held over nine days in March, we got to see more than 30 hot air balloons from across the world take to the skies. The Canberra skies getting more congested as the hot air balloons takes turns to fill up with hot air. You can’t miss this Beagle Maximus or Max as he is known to his friends, as he’s the largest Beagle hot air balloon in the world. You can either experience the thrill of the hot air ballooning by booking a flight with assigned vendors or enjoy the sight from the ground with compliments. Colour, sound and movement complemented by live music livened the occasion making it one big party. Shortly after leaving the hot air balloon event, our growling stomach naturally led us to the one of the most popular cafe in the city, The Cupping Room, which mission is to take diners on “flavour journey”. Judging by the long queue that forms up before it open, you can be assured it’s a journey well-worth. The team at The Cupping Room – including world champion barista Sasa Sestic, definitely knows a thing or two about creating that addictive brew. It’s even called “Canberra’s very own place of coffee worship”. With accolades like that, you can’t leave Canberra without at least a cuppa. I would go so much to say this cafe is firmly part of the foodie paradise trail that Canberra is famous for and worth a detour also for it’s superb food. Our latte and Fritters came wonderfully prepared and kept the cafe reputation intact. Their menu changes with the seasons and which I believe will ensure those perpetual healthy queues. The Questacon – the National Science and Technology Centre, is like the equivalent of Singapore Science Center. It is a large centre with more than 200 interactive exhibits relating to science and technology. It has many science programs that are devoted to inspiring the children to love science. This is place is great if you have kids on the trip. Questacon is an interactive science centre that opened in September 1988. It was developed by Professor Mike Gore, a physics lecturer from the Australian National University. Professor Gore went on to become the founding Director of Questacon. This my favourite part of the exhibits, a huge high-definition moon with details provided by NASA imagery of the lunar surface, hangs in the central part of the building. You can lie down on the bean bags on the floor and enjoy the soothing space like ambience. An artistic sculpture by Tim Wetherell, at the lawn of Questacon, representing parallax to measure astronomical bodies and recovery from the 2003 Canberra Bushfires. The Kingston Foreshore Redevelopment is a major urban renewal program in the suburb of Kingston on the southern shore of Lake Burley Griffin. This fairly recent development brings the “city to the lake”, by creating a waterfront location and a vibrant environment where residents can live, work and play. This venue is hub of fine-dining establishment and lifestyle amenities. Have a freshly baked apple pie, croissant or avocado smoothie at one of the cafes like Bean and Table and perhaps do a spot of people -watching. Either way, you will like the vibe and vibrancy of the place, especially after sun down. “The Foreshore’’ as locals call it, is a increasingly hip and vibrant destination. With convenient foot paths for lakeside walks and a boardwalk lined with a hub of eating and drinking options, it is the in-place enjoy the afternoon and watch day turn into night. For a unique adventure on Lake Burley Griffin, the electric GoBoat is the activity to go for. There is no need for experience or license to hire the boat which can carry up to eight people. Safety vests are provided and the silent electric is hardly audible so that riders can better enjoy the serene lake. The GoBoat concept of boating began in Copenhagen in 2014 and was created to provide a premium, environmentally friendly social experience out on the water. For the arts aficionados, the NGA is the ground zero of creativity. It is the Commonwealth of Australia’s national cultural institution for the visual arts and is a portfolio agency within the Department of Communications and the Arts. It is also one of the largest art museums in Australia, holding more than 166,000 works of art. The gallery also has a well-stocked retail shop selling arts publication and artist materials. Certainly a treasure trove for the art lovers. The gallery have a packed calendar of events and exhibition that ensure visual arts lovers from all the world make repeat visits. Enjoy the inner journey when you visit the NGA as the beauty of visual arts engage and tug on individuals in different ways. The NGA building is designed in the late 20th-century Brutalist style. It is characterised by angular masses and raw concrete surfaces and is surrounded by a series of sculpture gardens planted with Australian native plants and trees. The geometry of the building is based on a triangle, most obviously manifested for visitors in the coffered ceiling grids and tiles of the principal floor. This collection is dominated by the Aboriginal Memorial of 200 painted tree trunks commemorating all the indigenous people who had died between 1788 and 1988 defending their land against invaders. Each tree trunk is a dupun or log coffin, which is used to mark the safe transition of the soul of the deceased from this world to the next. (Wikipedia). This visit to Canberra and the surrounding regions marked yet another milestone in all my trips Down Under to key regions including Western Australia, New South Wales, South Australia, the Northern Territory and Tasmania. I can finally lay claim to visiting the seat of Australia legislative power and to correct my friends that neither Sydney or Melbourne is the capital of Australia. Most people tend to overlook the gem that is Canberra, preferring the well beaten tracks to the main cities. I hope this article will open their eyes to the beauty that the ACT has to offer, as the strange thing about Australia is the more you uncovered her, she still remains fresh, with yet more places to rediscover. Such is the charm of Australia. I like to end this article with a quote by Lovelle Drachman – “Blessed are the curious for they shall have adventures.” Yes, indeed, for our life adventures begin in our mind. Sincere appreciation for coming along my pixels journey. Should any readers be keen to go on a similar self-drive trip, please drop me a message or check out Jetabout Holidays package HERE! For my other Australian adventures, do check it out here. Footnote: All pictures used in this travelogue are copyrighted to Jensen Chua Photography and Jetabout Holidays and all rights reserved. The opinion expressed is factual, objective and that of the author.